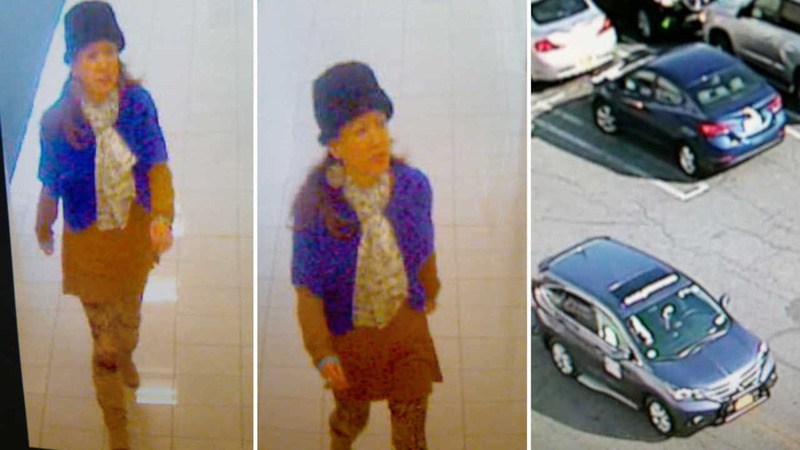 VALLEY STREAM, N.Y. (WABC) -- Nassau County Police have released new photos of an alleged suspect and her car after an attempted abduction at the Green Acres Mall in Valley Stream. The victim, whose identity Eyewitness News is withholding, decided to get some holiday shopping out of the way after dropping her two older children off at school. The quick errands soon turned into a nightmare. She told authorities that she was in Kohl's with her 18-month-old baby when she needed to change his diaper, and went to the bathroom to change him. The family room was locked, so she went into the women's room. Soon after she walked in and laid her baby down, she says a woman described as being in her mid-40s with a hat and a lot of layered clothing walked in. She says the woman noticed the child and commented that he was a "beautiful baby." "The feeling that I got in my chest and my stomach told me that something was wrong, that I was in danger or he was in danger," she said. She did not respond and continued changing her son's diaper, while the woman, according to the police report, started opening all the bathroom stalls to see if anyone else was in the bathroom. Then, as the victim was leaving the bathroom, she says the woman came toward her telling her to give her the baby, even grabbing the boy's arm. "She had come close, very, very close to me," she said. "I kind of put my hand up to stop her from getting too close, and she said, 'Give me the baby.'" The victim told police she hit the woman's arm and pushed her away, running out of the bathroom and into two women who asked if she was OK.
"She took his forearm, and I felt him pull back towards me," she said. "I didn't hit her or anything. I just pushed her arm away, and I said, 'No! '...When she touched my child, I felt like I'm in a dangerous situation, and if I don't get out this bathroom, she is either going to hurt me or hurt him." Security and police responded to the scene, and security footage showed the suspect accompanied by a man in a business suit who directed her to follow the victim into the bathroom. The two left together in a taxi shortly after the incident, according to police. The victim is now hoping others will be vigilant and aware of their surroundings. "You just have to be aware all the time," she said. Anyone with information regarding this crime is asked to contact Nassau County Crime Stoppers at 1-800-244-TIPS.